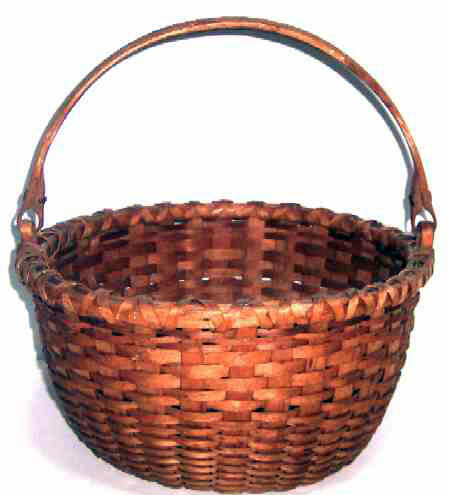 Presented here, a very fine Swing Handled Splint Basket by Alva Lord of Lovell, Maine. His baskets are much sought after by collectors and appreciators of fine basket weaving. There are the identifiable signature elements always found on Lord baskets to include the two rows of narrow splint weavers at the top, the spliced weaver in the kicked up bottom, and the rivited handle fastenings. The basket is 10" in diameter and 5" tall, not including the handle. It is beautifully patinated and a warm nut brown color. The quality of the work is fantastic and not surprisingly so, as Alva Lord learned basket making from the Shakers.